It’s not often that I wish I was in Florida. Usually I’m perfectly happy being far from it. But yesterday, on my lunch break at work, as soon as I walked out into the blaring sunshine and high temperatures of what felt like a preview of another New York summer, I found myself wishing I was in Florida. In Key West to be exact. In a hammock in the shade, somewhere near the water, with a fat wedge of key lime pie to be even more exact. Big Gay Ice Cream’s Mermaid Sundae. Hellooooo, summer. I love Key West and its laid back, mellow vibe, hippy residents, and kitschy charm, but more than anything else about it, I love the city’s most famous desert, my favorite Florida treat, key lime pie. Since boarding a plane to the Sunshine State wasn’t an option, I got my fix at Big Gay Ice Cream in the West Village instead, where I ordered the Mermaid Sundae. 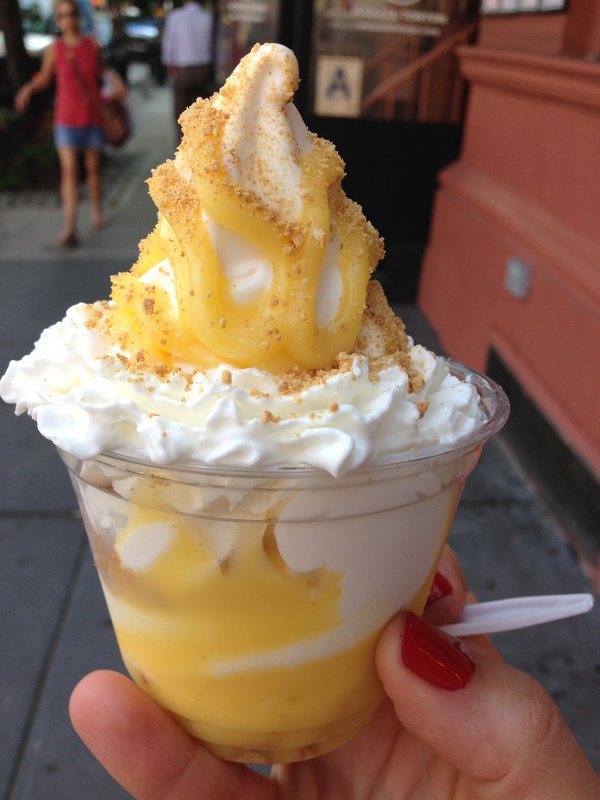 A heaping cup of creamy vanilla soft serve, thick swirls of bright yellow key lime curd, crushed graham crackers, and velvety swirls of fluffy whipped cream were exactly what I needed to take the edge off a hot afternoon. Sure, there was no hammock, no ocean, and certainly no laid back vacation mode, but that perfect combination of sweet, tangy, and tart flavors, and the creamy, smooth and crumbly crust textures of Big Gay Ice Cream’s salute to the key lime pie was all I really needed. Everything else I just closed my eyes and imagined was there. This entry was posted in Sweet stuff and tagged Big Gay Ice Cream, graham crackers, ice cream, key lime curd, Key lime pie, West Village, whipped cream. Bookmark the permalink. Right? I’m basically gonna need one every day for the rest of summer if I’m supposed to live to see fall.